In previous blog post we have already discussed the history and origin of "Ajrakh" in detail. In this blog we will discuss the real ajrakh technique which was printed on the both the sides of the fabric. Ajrakh print is one of the complex, arduous yet beautiful and one of the oldest known hand blocks printing art to print the fabrics. Some 4000 years ago it was mainly practiced in Sindh region of undivided India now it is in Pakistan by Khatri (Chippa) community. Today it is widely practiced in Gujarat region in India and some parts of Rajasthan. Some 200 years ago few families migrated from Sindh region to Gujarat. It contains twenty or more steps in preparing final product. It is a combination of resist and mordant based printing traditionally using geometrical designs with natural colors on variety of natural fiber based fabrics. Two thousand years ago few Arabic merchants visited Sindh for the first time and saw the circle and star shaped geometrical designs with the combination of four basic natural (Indigo, Red, Black and Yellow) colors instantly they call it “ye to Ajrakh hain” (This is a Ajrakh). In Arabic language Ajrakh means the Universe, and since then it is known as Ajrakh to the world. Traditionally Ajrakh printing was originally done on both the sides of fabrics using same blocks so that one can wear it either of the side. But today due to increasing cost of labor, raw materials and time consuming process it is printed on one side only. Traditionally lugda (Saree like cloth), lungi and turban were made using “double sided” technique but today it is rarely practiced. Only few of the craftsmen left who still practice this craft on order. Considering its cost, time and expertise today it is done on stoles and dupatta only. It requires more time and efforts for "Double sided" than printing one sided ajrakh work. First a resist paste made from multani mitti (fuller's earth) and Gum Arabic used to print on both the sides using the same block design and then with little changes done same technique used to print the fabric practiced for one sided printing work. Though it is a master piece work but sometimes to make a very master piece work it requires 2 to 6 months depends upon the mood of the craftsman. Once a ajrakh master craftsman Shri Manoj Khatri from Barmer, Rajasthan told us during a conversation that sometimes it took 6 months to an year in preparing just 20 dupattas. Meena ajrakh is rarely practiced craft technique today and to have it in "Wardrobe collection" is like having a "Kohinoor" among diamonds. 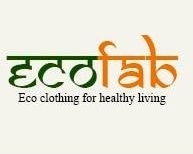 EcoFab is all about Indian handicraft, handmade textiles, handloom and natural dyes.